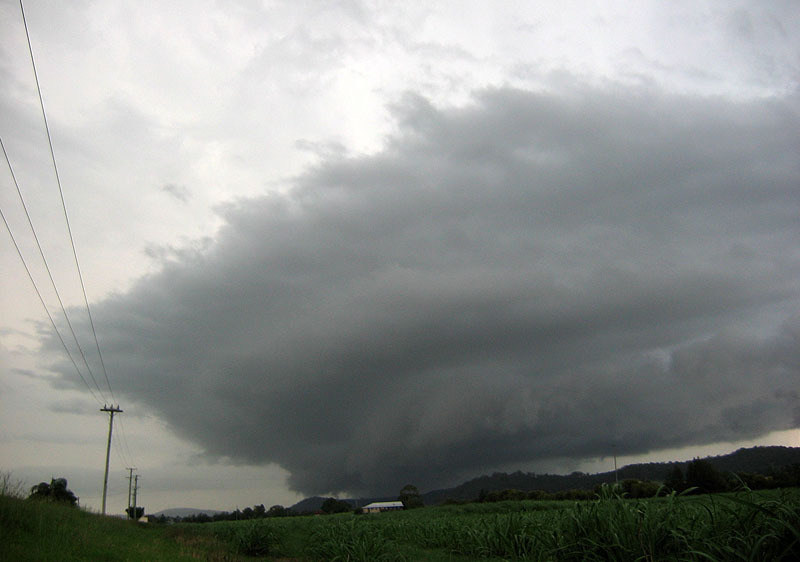 Wednesday 30th November 2005 - The supercell bonanza continues - this time in the Clarence Valley of NE NSW! A look at the models and satpics late morning showed a nice area of instability running along the troughline from the Darling Downs into NE NSW, and there was already a bubbly cumulus field in the Darling Downs. 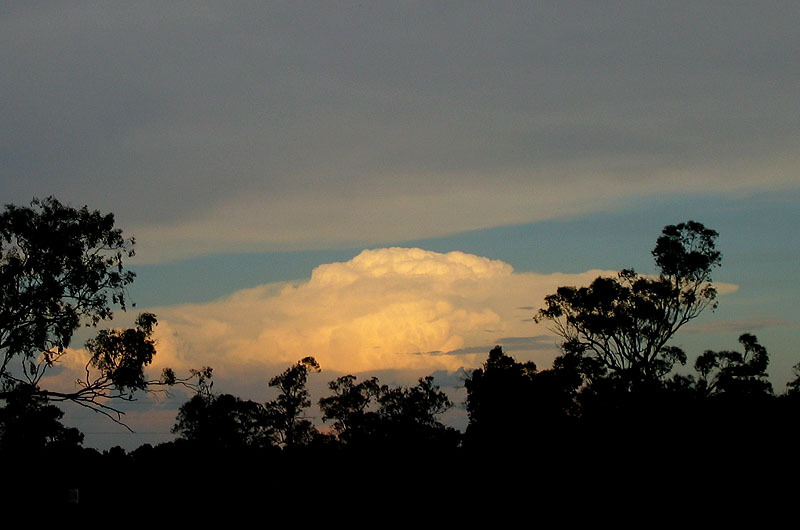 The strength of this development drew us across to Beaudesert by lunchtime, with the option of going west to intercept the storms already developing on the Downs, as well as keeping options open with Lions Road into NE NSW if we needed it later. Over lunch we reassessed the situation, and as soon as we looked at the satpic we could see that the large anvils developing to our west were likely to ruin the chances of any development in the Brisbane Valley and the Border Ranges, and even parts of the Northern Rivers if we were unlucky! So we headed quickly down the Mt Lindsay Hwy towards Rathdowney and then down Lions Road to Casino. 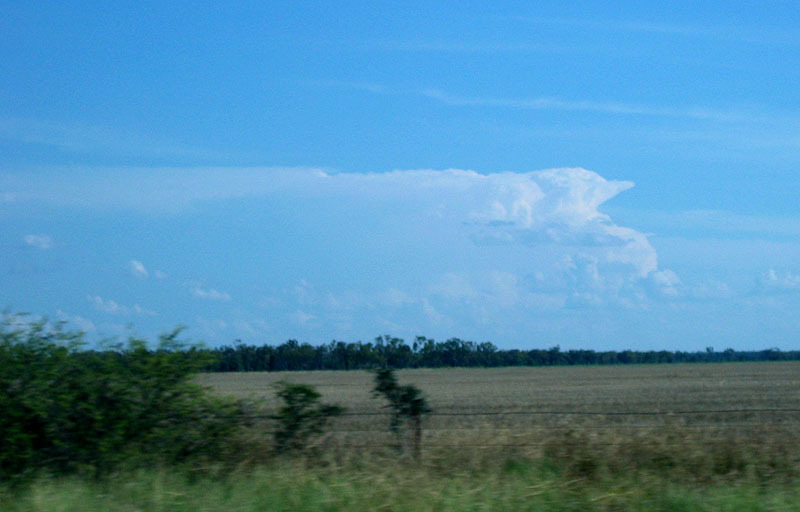 On our approach to Casino we could see a storm developing in the Grafton area, just to the south of the huge anvils created from the Darling Downs storms. The main feature of this was the strong updrafts on its W flank and gave the appearance of moving NE (soon confirmed by radar). The bad news was that this storm was beginning to move into the anvil cloud, but surprisingly it a) it wasn't affecting the storm and b) the anvil cloud was thinning out! After taking the direct route to Woodburn and the Pacific Highway via Coraki we made the commitment to drive through the 30 kilometres of bushland with no views and move into the Lower Clarence. The tension began to build as we could see on radar that the storm was still kicking along quite strongly! 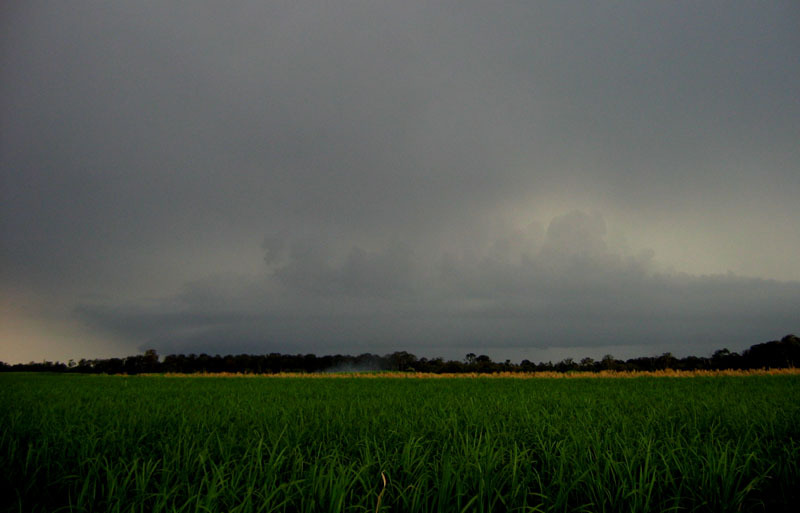 As we approached the north arm of the Clarence the country opened up with a good view to the SW towards the storm, and although it wasn't showing any visible features just yet, we could still see that overall it looked quite strong. So after setting ourselves up just off the Highway at Harwood, we waited for it to approach. After 10 minutes observing, we decided to move south towards the Eastern edge of the storm complex as it was beginning to display some interesting structure! We ended up just to the east of the Yamba turnoff and very close to the Clarence River, right amongst the cane fields in the heart of the valley! 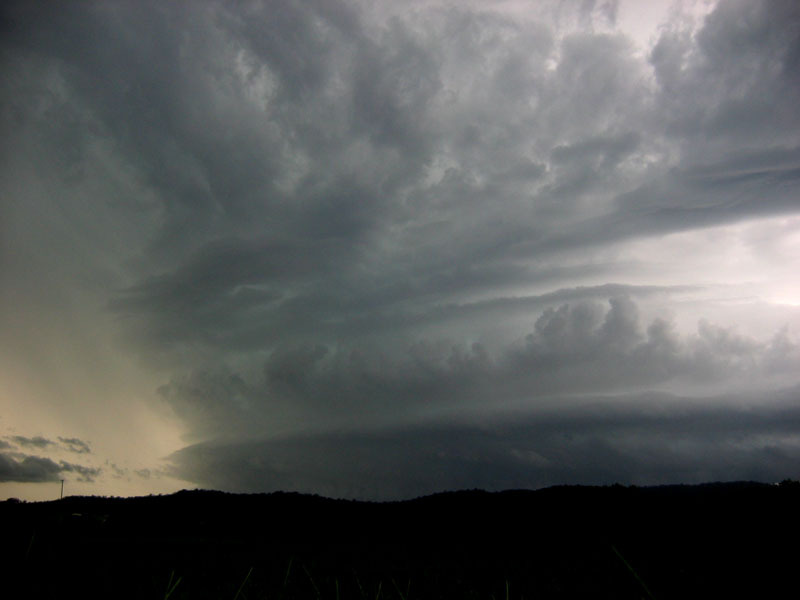 It was here that we observed the dying stages of a quite probable supercell as it slipped off to the SE. 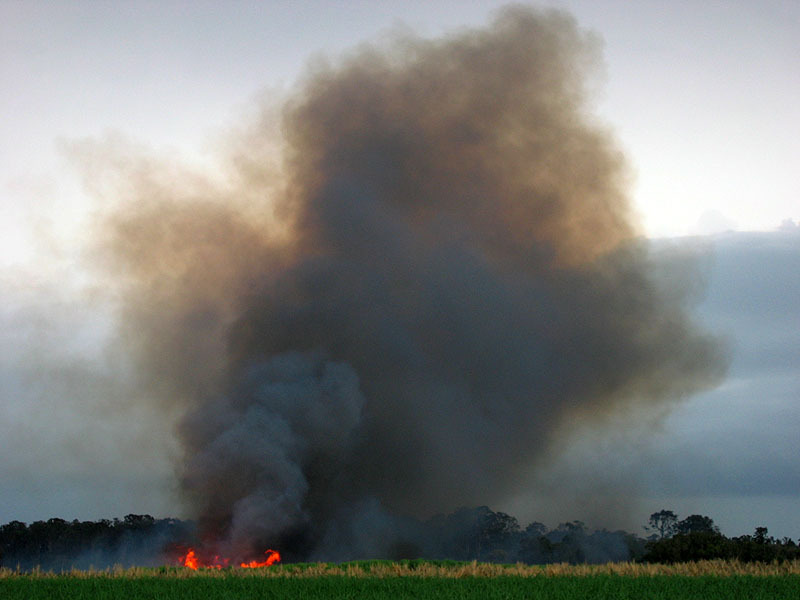 We also noticed the beginnings of a cane fire - not sure if it was the traditional burning of the base areas or not, but it did seem a little large if it was a controlled fire! 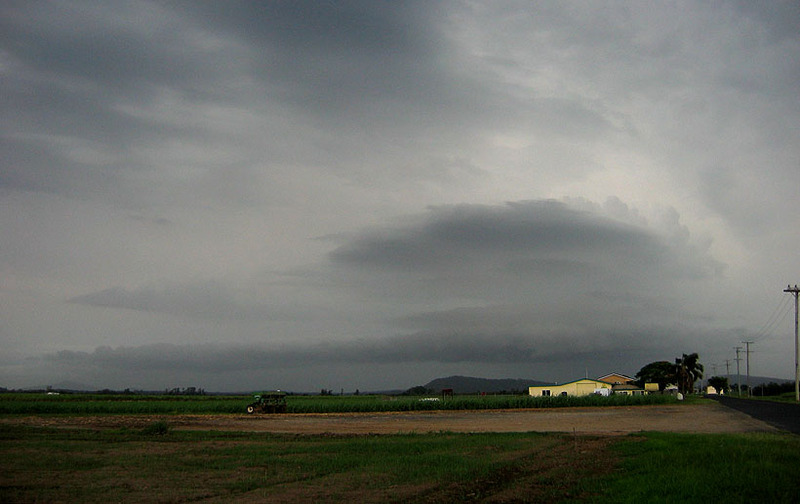 After seeing the demise of this first storm, we noticed that the northern edge was looking much more interesting! So we drove quickly back to our original spot at Harwood. 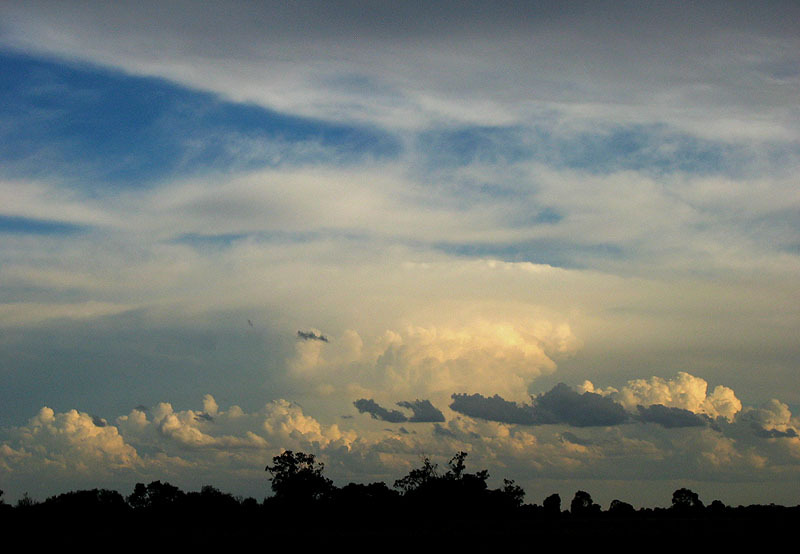 Only five minutes after the last photo in the previous series, another storm developed! 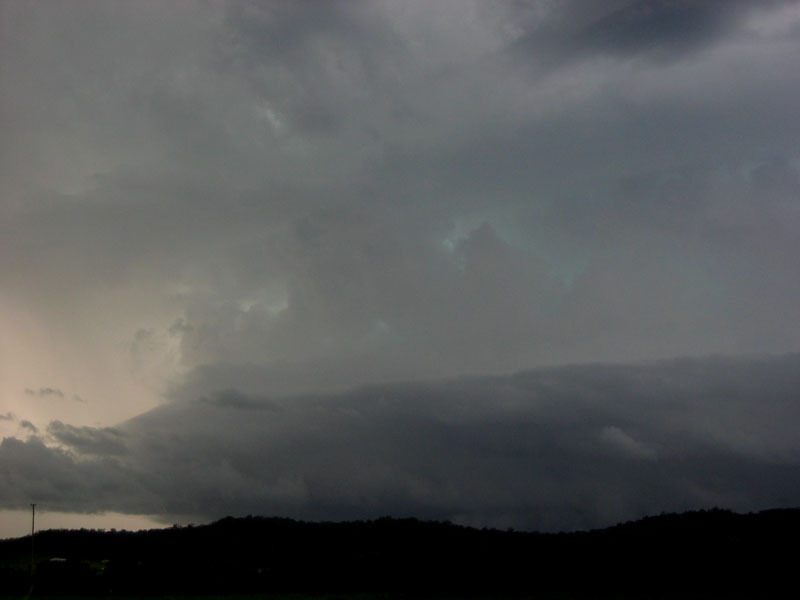 To be honest we got a little lazy, so I haven't got any photos of this third storm in its early development, but I still have another sequence of photos of another lovely supercell! We were certainly being spoilt. 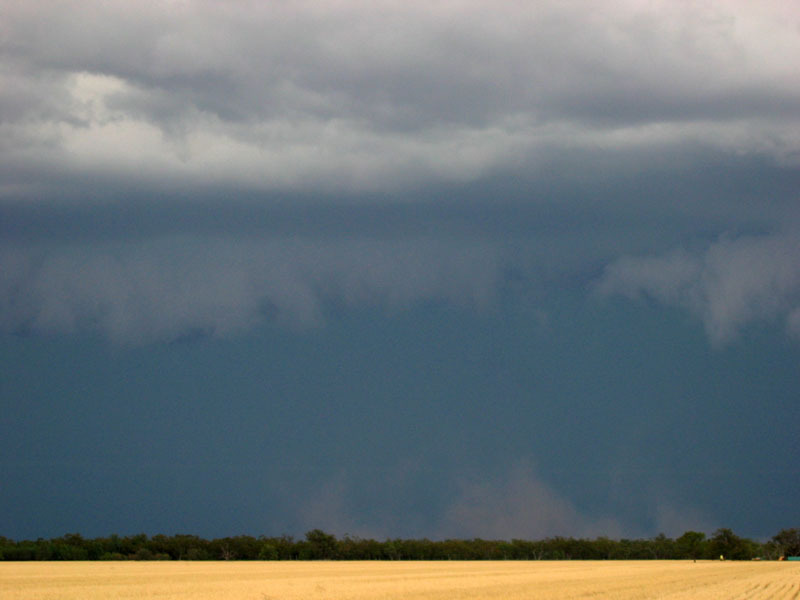 Before I move on, I'd like to make a few comments on this 'collection of supercells'. 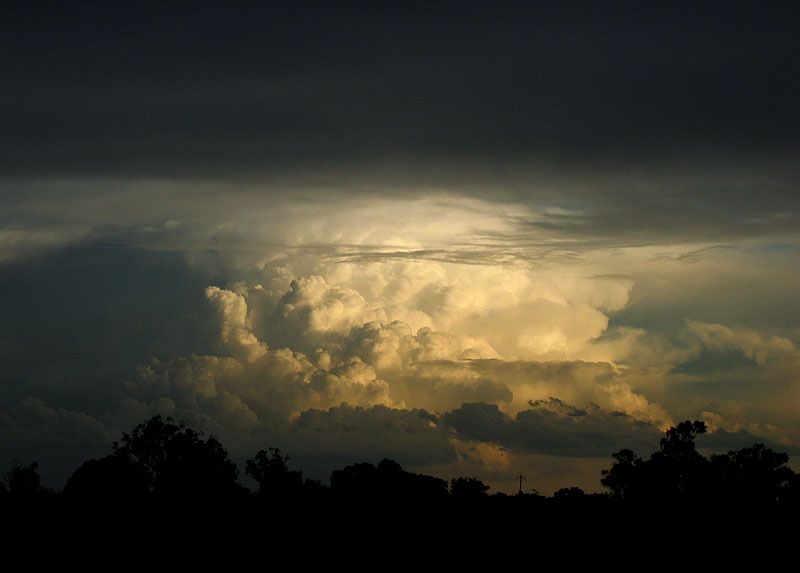 They seemed to be operating as if there was a central axis and these storms were forming on the northern flank, moving around in a circular fashion eventually dying once they moved past the eastern side of the complex. Just like a rotating table with food dishes being presented as it moves around in a circle, we sat there and watched all three of them! 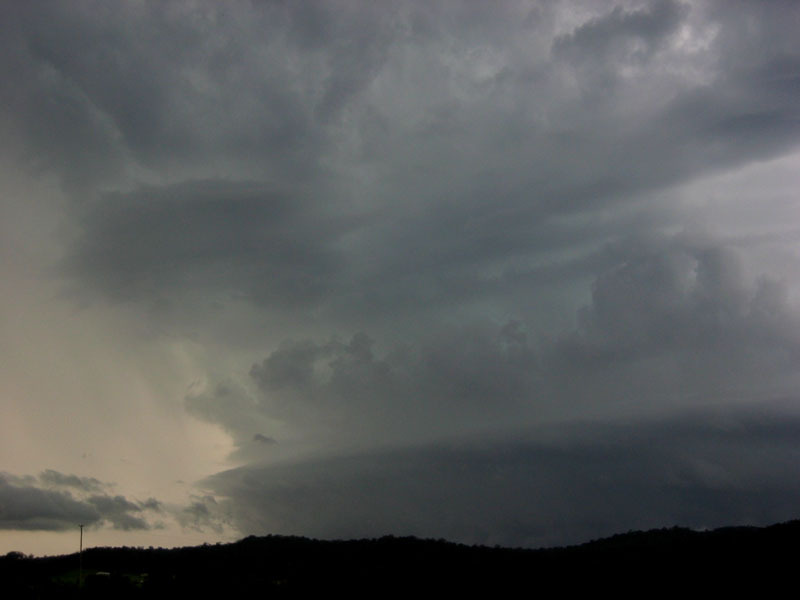 Eventually this storm decayed and gusted out, and we got in contact with one of our great friends and Northern Rivers storm chaser - Dave Ellem! 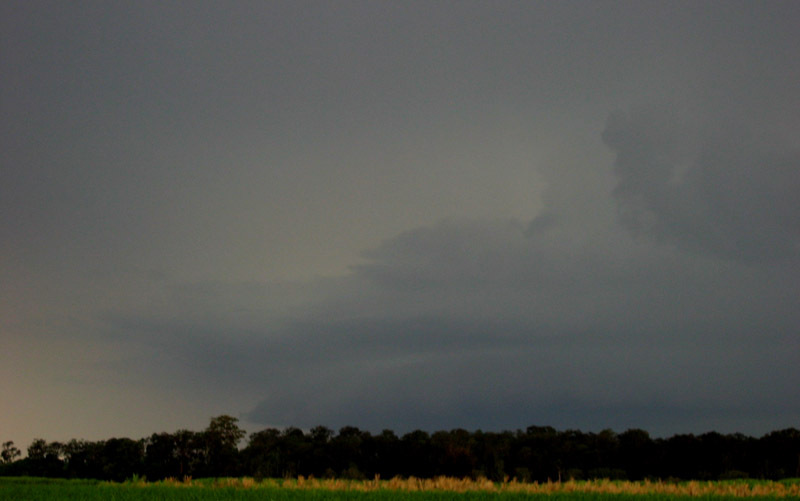 He had caught the latter half of the third storm and was just as stoked at the structure it displayed as we were! After a few last photographs, we decided to make our way to his house as free lodgings were on offer! After dinner at Woodburn, we observed some lightning to our south, and a look at the radar suggested it was from a line of storms between Grafton and Coffs Harbour! 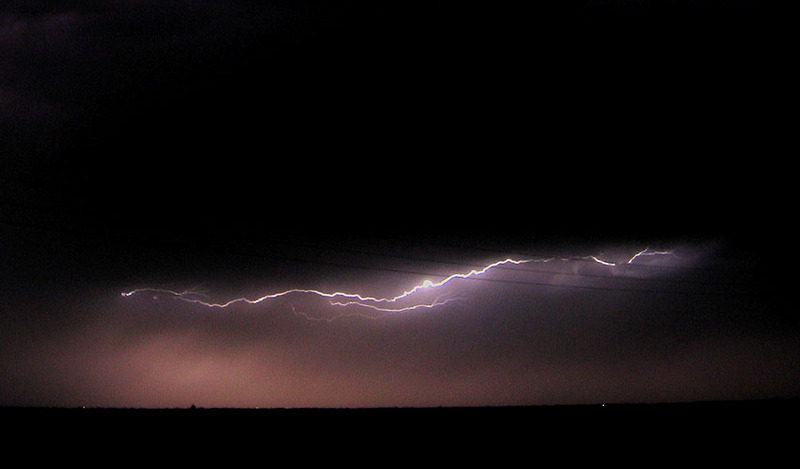 I jokingly said to the fellas that we should get down there and see the lightning and stay at my house for the night, but although we didn't get any photos of the show (and it looked mighty nice from 100km away!) the good news was that James Harris snapped a few while at Nambucca Heads that evening! Our target for this day was Goondiwindi and further west, and after a reasonably early start from Lismore, we were in Gundy by early afternoon. There was development in the Mungindi/Dirranbandi area (a good 100km+ west of Gundy) so we headed straight out towards Boomi, where there was a bit of minor flooding on the roads from the storms during the past few weeks. 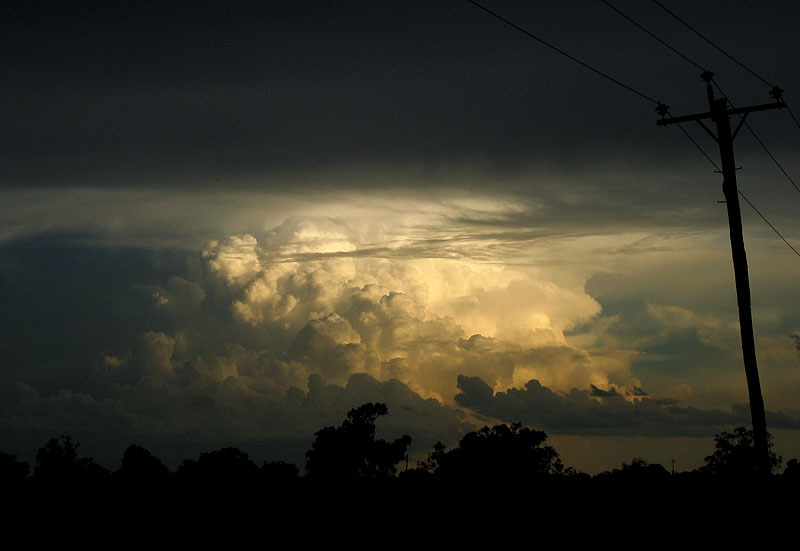 As the anvil from the storms to the west came over the top of us, we observed quite a strong looking storm somewhere in the Narrabri area, approx 200km away! We continued on the drive to Boomi, and the makings of some base features began to appear. We decided to head on the road south from Boomi to keep with the storm as it continued to move SE, and it was here that we set up to watch it. But before I took any photos of it I was drawn to the magnificent updrafts on the storm that was now NE of Narrabri, still going strong! 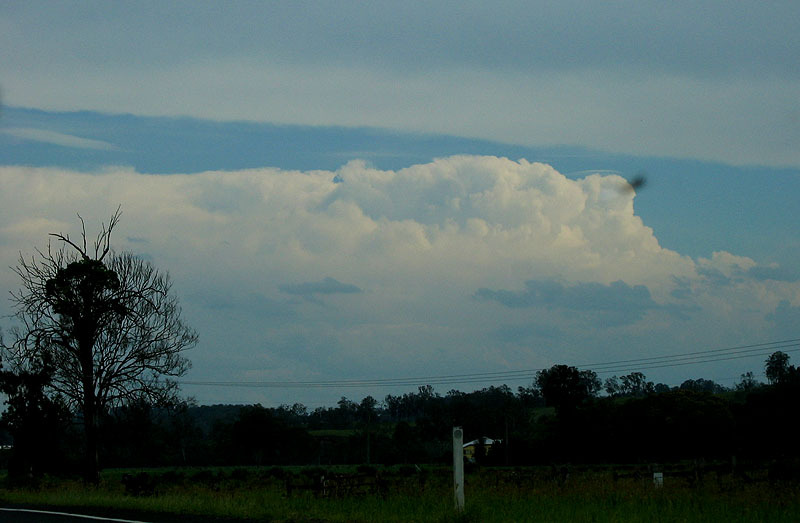 There was also a storm that developed in the Inverell/Texas corridor which displayed similar updraft structure (the second photo below). 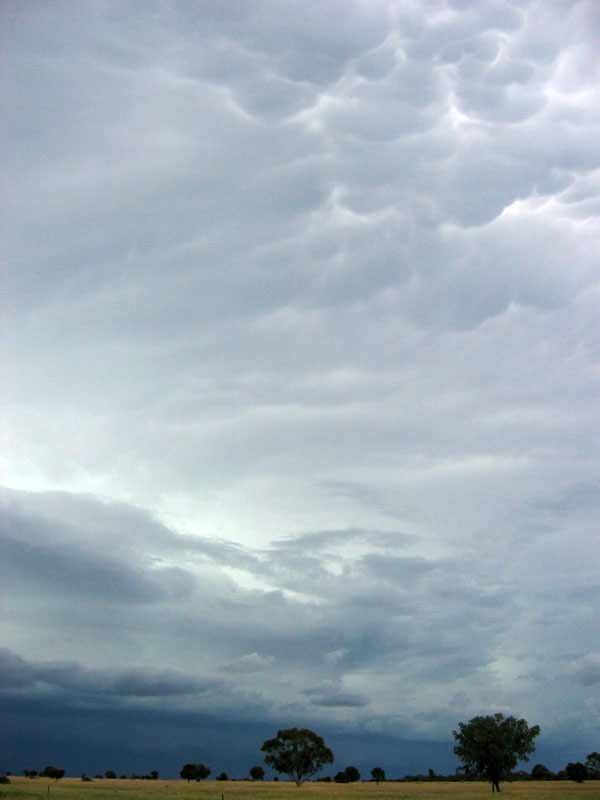 Now to the storm in front of us - it was displaying a strong crisp anvil, and quite a decent gustfront as it approached! 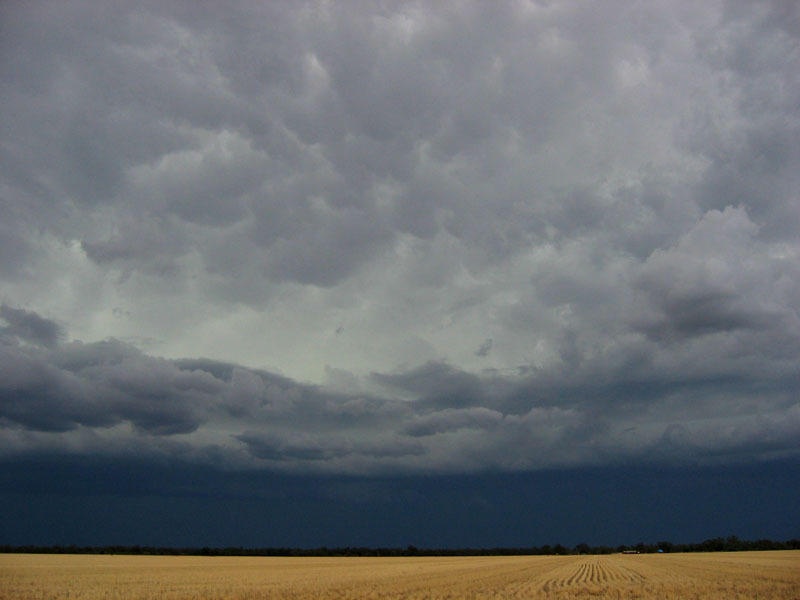 Meanwhile, back to the storm in front of us, it was closing in fairly quickly so we hot-footed it to Garah, and down to Moree, with the option of heading SE or E afterwards. 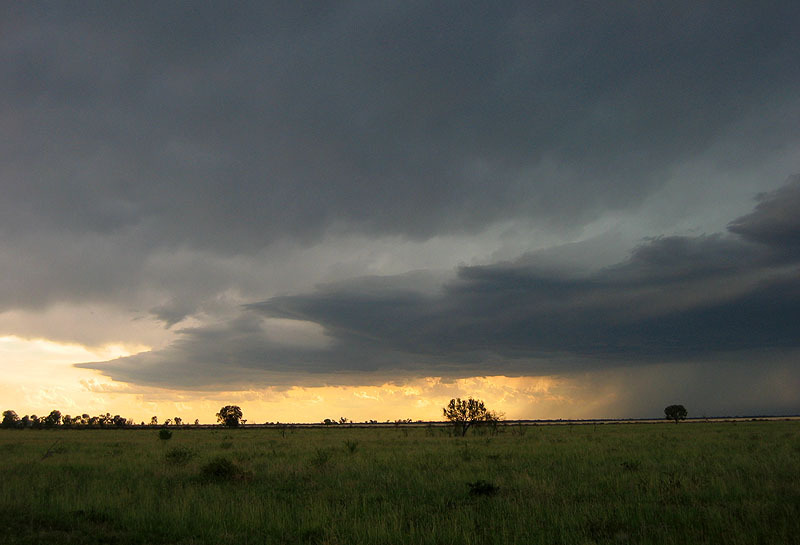 Arriving in Moree, the storm nearly caught up with us but we had enough time to get a few km out of town and set up for some photos of the guster just before sunset, and hopefully get some lightning! 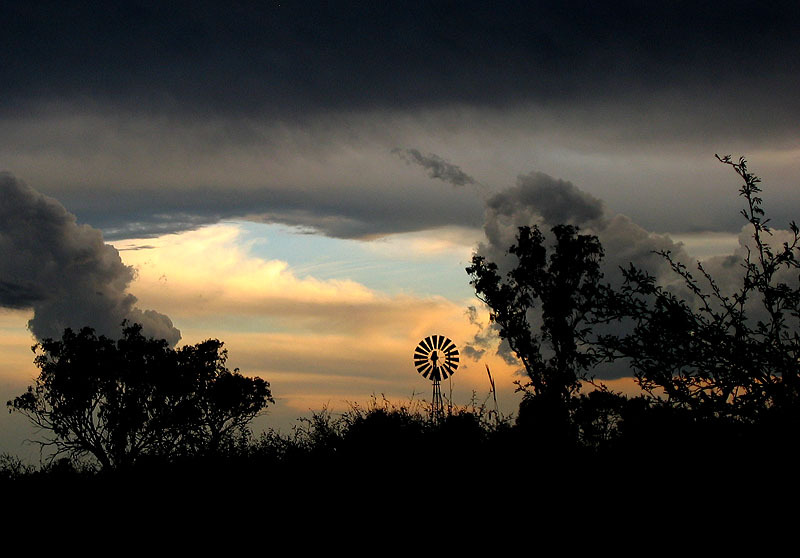 I also managed a photo including a windmill - what would a TDU be without a photo of a windmill in the country! 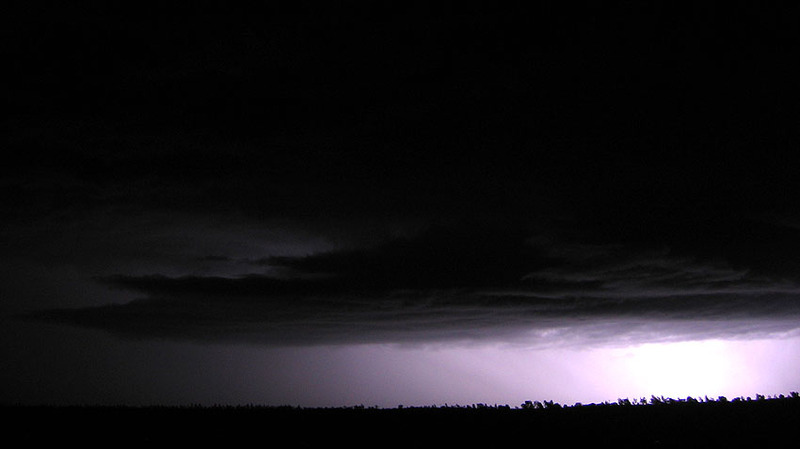 After moving over Moree at sunset, the storm began to move much slower and decayed, giving a few flickers of lightning, and one of them was enough to light up the gustfront as we called it a day. 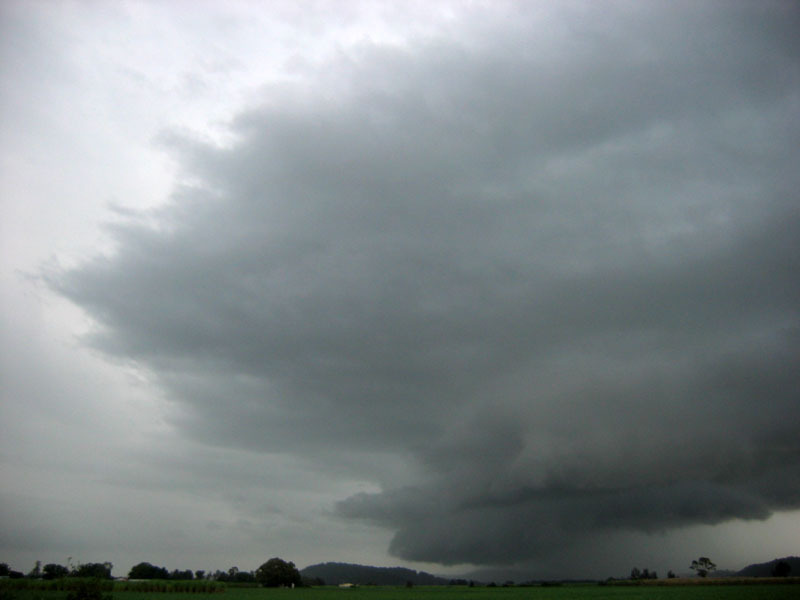 Friday 2nd December 2005 - Statewide squall line across NSW with 200km guster chase! This day was looking like another possible big day, if we got out there early enough. 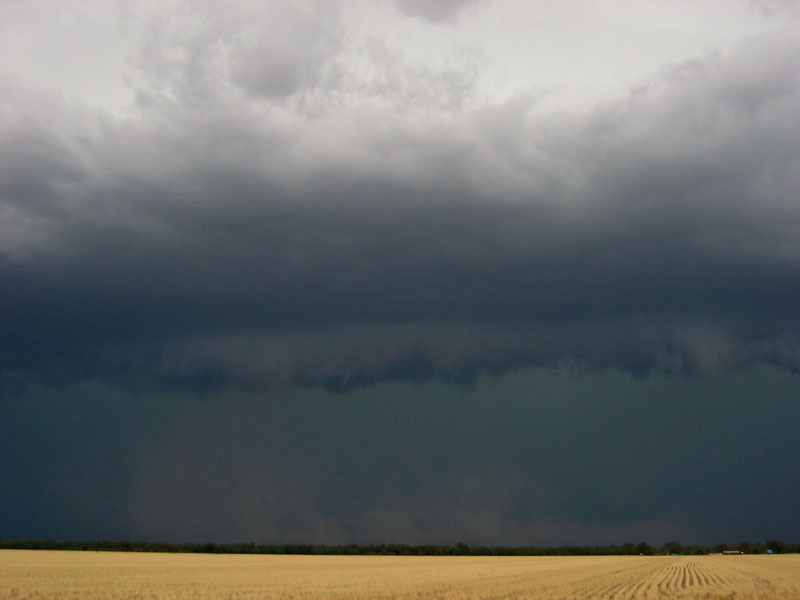 We wondered about the possibilities of isolated supercells developing ahead of the squall line that would develop. The satpic at mid-morning was showing a squall line already developing in the west of the state, with some strong storms on its northern edge (west of Bourke) which would soon join the squall line as it extended to the north and moved east throughout the day. 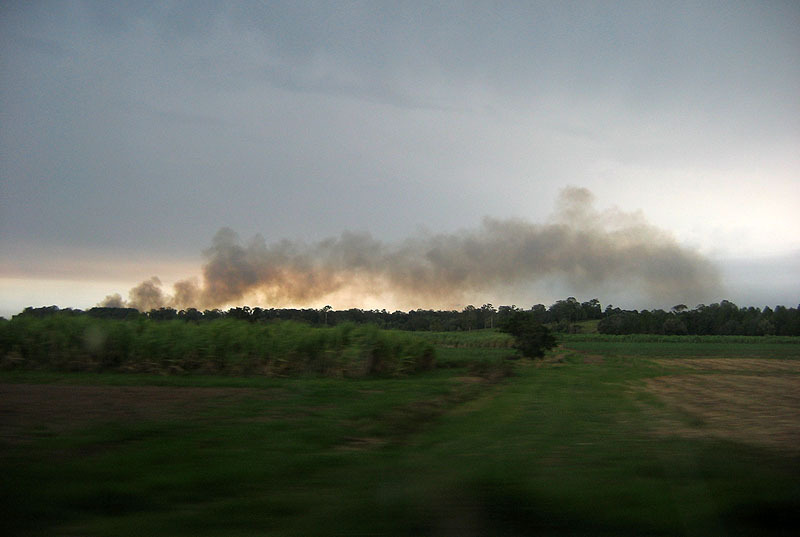 We decided to drive out to Walgett via Narrabri, as we were tempted by the better wind shear further south. After lunch at Wee Waa, we discovered the glorious chase road that is the second half of the road to Walgett! The first third of the Kamilaroi Hwy after Narrabri is fairly treed in, but still chaseable, but the clearings quickly increase until you get the best part of 100km of pure, cleared, flat country, with practically no trees at all! Naturally visions of the great plains of the US came to mind, and the environment was very impressive too, with a large amount of moist low level cumulus riding the strong NE winds, straight towards the line of storms whose anvils were now beginning to pass over us! We arrived just east of Walgett and we stopped at the place where Dave Ellem and myself had sat for a few hours on Nov 26. 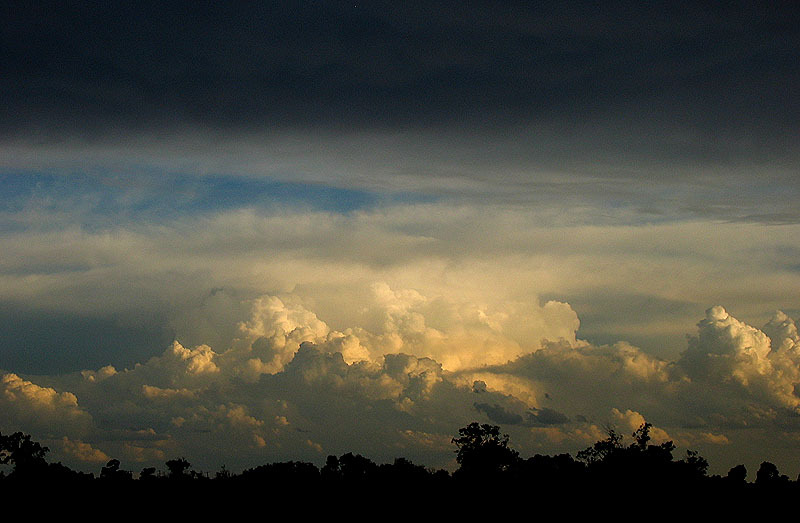 Soon enough we saw the makings of a wide spanning gustfront on the western horizon! After a short while we decided to get moving on the road back to Collarenebri as the guster would overrun us if we weren't careful! So we began the trek along the Gwydir Highway to Collarenebri, and then back towards Moree, with stops every 20 minutes or so to take more photos of the guster! When we drove through Moree we decided that we'd set ourselves up north of town with a view to the west and let it pass over us. After some more photos on its approach, we let it go and jumped in the car to see what it could do, as it looked fairly benign aside from a fairly strong green glow! Some strong outflow gusts occurred, as well as some close CG's and a bit of small hail - a bit of excitement towards the end of the day. 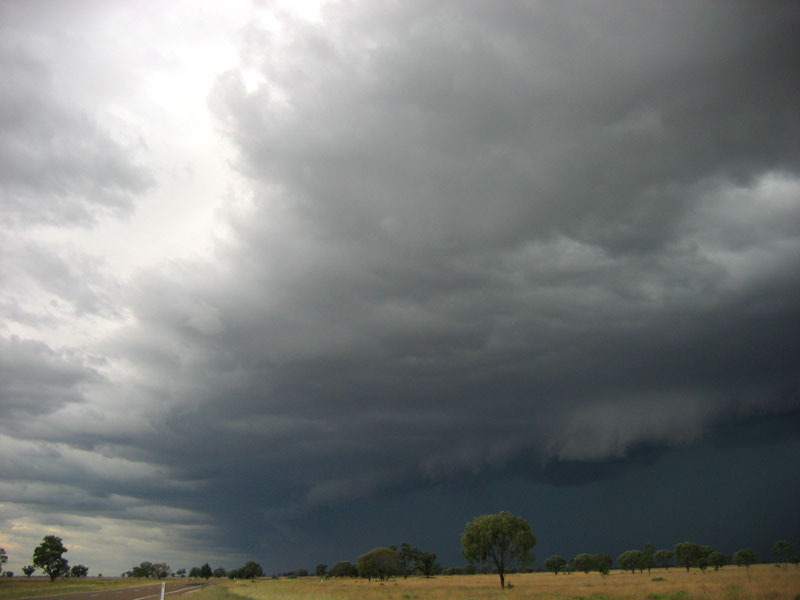 As we drove north towards Goondiwindi, with the next days chase in mind, the squall line developed some more updrafts just behind it, so we were left in long bursts of moderate to heavy rain for the best part of an hour on the drive. We noticed that there was some nice lightning activity on the back end at dusk, so we set up the tripods just west of Boggabilla to try and grab some photos. 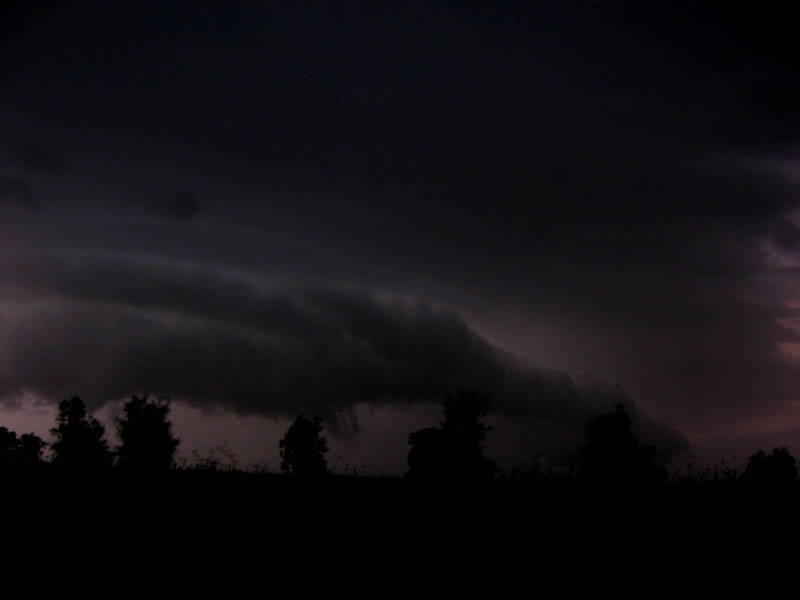 While lightning was somewhat infrequent, when it did happen there were some of the best anvil crawlers I have seen in a while! 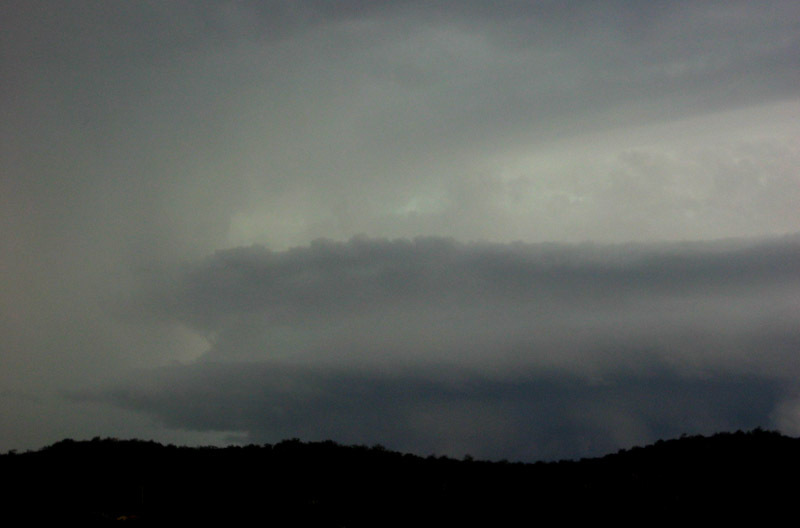 I was very sad after I couldn't bag one at all, my wish for TDU still unfulfilled of getting a nice lightning photo! In fact I missed probably the best crawler of the night by a second :( But, I do have one half decent photo of a little base crawler below. 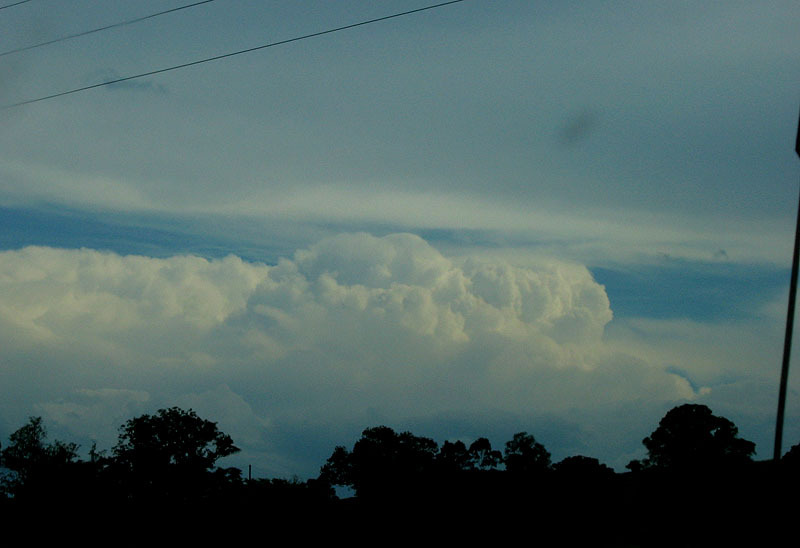 A new group of small storms was developing to the west at this point, and there is two photos of the structure of that. 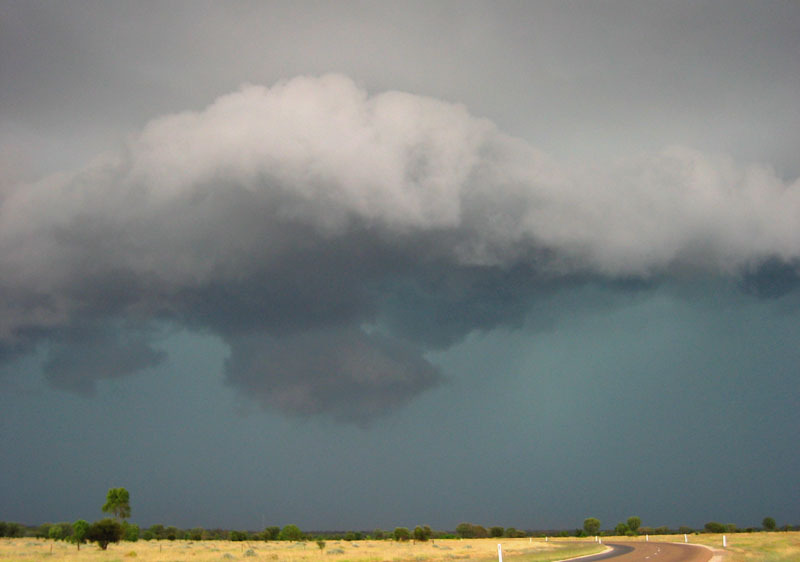 The original show died down, and we drove into Gundy to get our lodgings for the night, but while we were unpacking our gear, the new group of storms nearly beat us! It began to pour down rain as we grabbed some dinner and we decided to sit and watch the show, considering the rain was lingering too much to take any photos. 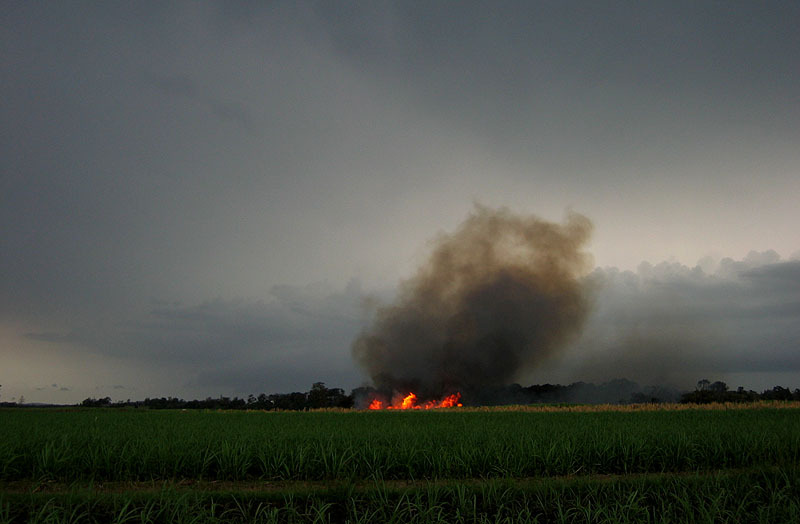 So we soaked up the view and the incessant croaks of the frogs, interrupted regularly by deep rumbles of thunder!